Rancho Alamitos High School opened its doors in 1957. Its name means ranch of the little cottonwoods and is an acknowledgement of the Hispanic heritage of this area. The forty acres of the Rancho Alamitos High School campus was part of the original Rancho Los Nietos (grandchildren), circa 1784. Later, the land was divided among many family members into smaller Ranchos. In the 1950’s, the Garden Grove Union High School District purchased the land from the Evans family. Construction of Rancho Alamitos High School began in 1956 and was nearly complete by 1957. There were two homes on the property facing Dale Street. The homes belonged to the Evans and Miller families and were located just north of the faculty parking lot. The homes were used as classrooms until construction was completed in 1959. 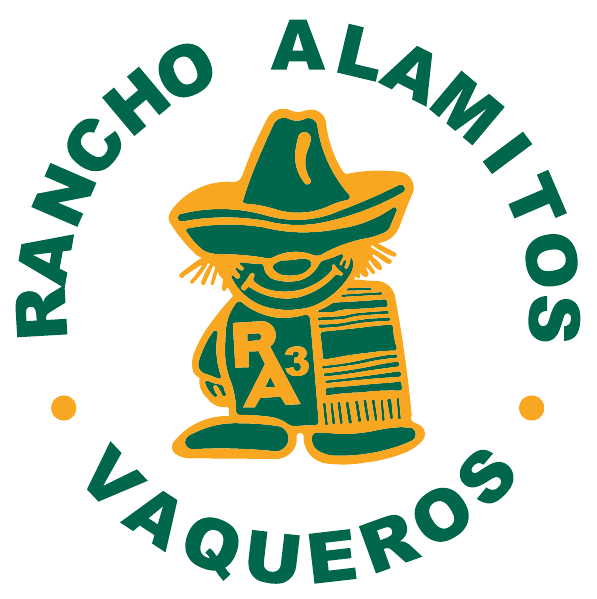 The Rancho Alamitos mascot is the Vaquero. Vaquero is a Spanish word for cowboy. The Vaquero was chosen in respect for the men who worked the lands of old Rancho Los Nietos. Over the years, the Vaqueros have been known for their hard work, dedication and pride of accomplishments. The traditions started many years ago still continue. 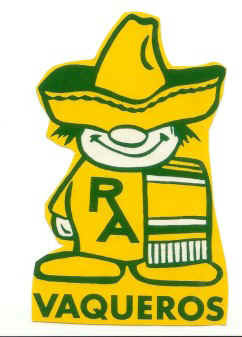 We are proud of our heritage and proud to be Vaqueros! Beneath the western skies, Your colors Green and Gold. We pledge, we’ll edify, and conquer all for you. In the beginning of the 60’s, the Bee Football team, coached by John Callard, was a success-ful team. They were fighting for victory, each week shadowed by the mighty Varsity team. Some students started referring to the Bee team as the "little" Vaqueros. Doug Rowell was a member of that Bee team. He came to practice one day with his drawing of a team mascot, "El Poco Vaquero." All his buddies on the team and Coach Callard embraced this mascot. As with any great idea, "El Poco Vaquero" spread like wild fire throughout the school. He was embraced by the student body and faculty, not just for the Bee team, but for the Varsity and all sports. "El Poco Vaquero" was shortened to "Poco." The alumni from the classes of 1961 to 1975 hold Poco in high esteem and deep love. He is the embodiment of the Spirit of Rancho during those years. He will always represent our golden days of high school, our great school spirit, our victories, our friends and our joys.